Peak Energy: Argentina: energy boom or energy cliff ? Argentina: energy boom or energy cliff ? Resilience has an article on oil and gas production in Argentina (which indirectly explains why the Chileans are so interested in large scale solar power now), including a look at the reputedly large potential for shale oil production in Patagonia - Argentina: energy boom or energy cliff?. At the end of the 20th century, Argentina started exporting gas to Chile, a mirage of the gas possibilities in this country. Both Argentina and Chile believed that the supply was going to be increasing forever. I visited Chile invited by Compañía de Petróleos de Chile (COPEC) in 2011. I also had the opportunity to meet with top officials of the energy sector and academic experts in energy. They all believed that Argentienan supplies would last for decades. I could not understand why very professional people had such a belief, when data on reserves and possible flows of their neighbour country was probably available to them. In fact, they embarked in an ambitious plan to develop pipelines across the Andes to supply Chile from the Argentinean network and ordered a number of gas fired power plants, trying to avoid or minimize, for instance, the heavy smog of Santiago, and for other economic reasons. 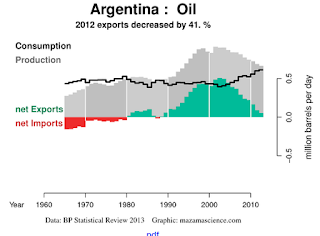 However, and without previous warning, Argentina reduced shipments to less than half. 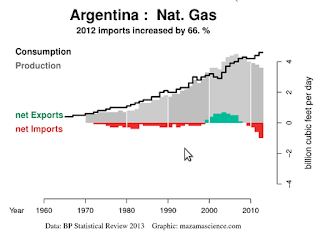 The obvious reason, as seen in the figures above, was the depletion pattern of the Argentinean gas and the need to prioritize their own domestic consumption. This left overnight the Chileans with big recently erected infrastructures idle and difficult problems to attend their growing internal energy demand, especially in electricity production for the extractive industries that they had expected to satisfy with the gas fired power plants. They had to move fast to build a regasification plant in Quintero and now another in Mejillones. They did it in a record time, but certainly at a cost they had not imagined. 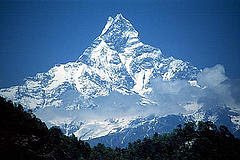 This coincided with the sharp increase of fuel consumption that had started at the end of the past century. They needed to sign urgent contracts with LNG tankers and suppliers (i.e. Qatar), something that created for them what they called the perfect storm. Chile was in 2011 paying one of the most expensive electricity tariffs in the continent, partly due to this important bad planning.